I’ve edited the list to sort out some costumes that I will probably never make; to remove some that I *have* already made, and to add some which I would like to make. Here are some gowns that I would still like to make for myself. This collection could be called my “personal costuming dream closet”; if I should ever actually finish that list, I can as well kill myself because then all my dreams (costume-wise) will have been fulfilled (or I will be dead for other reasons until then, because let’s face it – my health is currently not the very best; but that’s not a subject for this page). However, as there are still sometimes more costumes coming up that interest me, this list is subject to change – not for the gowns that are already on it, but for others that I add from time to time. Some will be moved, because the planning for them became so long to read that they require own pages. Others will perhaps never be made, simply because I just find them nice but have *so* absolutely no use for them. They are listed in no particular order, except in which I have found the pictures on my hard disk / remembered to write them down. If I find new costumes that interest me, I usually add them on the top of the list; same goes for costumes which I already had on this page for a longer time but now found new information about which I then added to the planning. For some of them I already have collected some (or even all) materials, started the planning or even the actual work, other just seem interesting to me for other reasons. Some of them have one or more “+” behind their names; the more there are, the more important the gown is to me and / or the more I like it. Edit – this gown now has its own page, here. OMG – SQUEE! I didn’t think that I would ever be able to announce this, but I’m utterly happy to spread the news that I found a fabric which might be suitable to be mistreated in a way that I could make myself *THE* portrait gown of Eleonora Di Toledo, at which I have marveled for years! Alright, it’s not a cut velvet on a satin ground. In fact, it’s an ordinary polyester organza – but with a *flocked* pattern. And – read and be amazed – this flocked pattern can be dyed, but the backing (the poly organza) of course can’t. 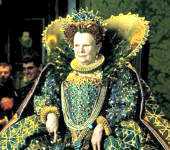 Now – dyeing alone wouldn’t make it for this gown, as I need the pattern in three different colors – black, dark green and gold. BUT I can use silk painting colors, which will do the same job (and which also won’t stick to the poly organza backing). I can then flat line the poly organza with an ordinary silk satin and – Voilà – I’ll have something that will actually work for this gown! I already have the poly organza, now all I need is the silk satin,. another proper interlining, a *lot* of silk paint, some time – and then I can start working on this one! 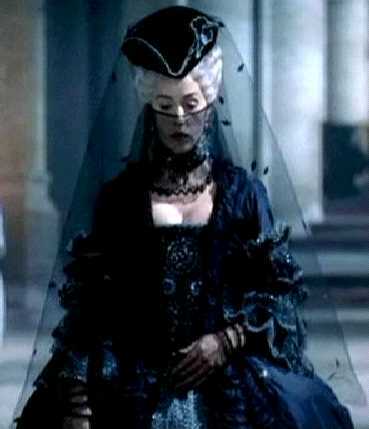 These are two gowns worn by ‘Sylvia’ / Monica Bellucci in ‘Le Pacte Des Loups’ – “Brotherhood of the Wolf” which I find just breathtaking. The first one, with its cobalt blue coloring (see the studying page for that movie to see the actual color of the gown’s jacket! ), is *so* my colors! And the second one (also shown on the studying page) – well, a very good friend of mine recently got me interested in the subject of a ‘black widow’ costume. And when I screenshotted the movie, I couldn’t help but thought of just that when I saw that particular gown; so in case *I* should ever want a black widow (meaning.. if I should ‘accidentally’ stumble over a matching fabric…) – that would be mine! By now I have studied the second costume a bit closer. Obviously it’s not quite historically correct, but I will try to make the best of it. 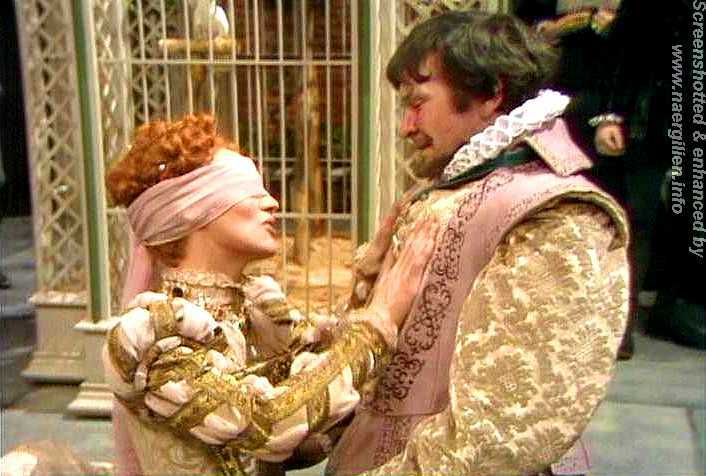 The bodice part seems to be closest to what would be called a ‘Robe à l’Allemande’ with its sleeve decorations; so I will take that as a base pattern to re-create the costume. 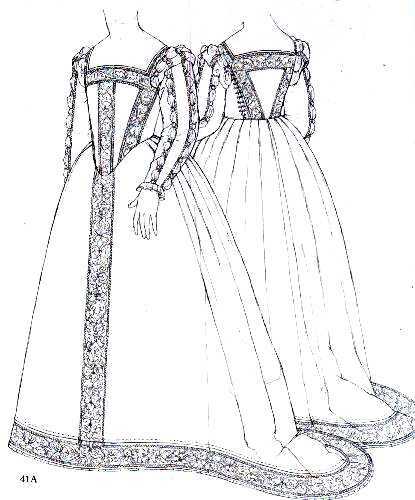 I will have to change the split overskirt into a *very* short court train, as split overskirts weren’t worn with the Allemande bodices – but court trains were; and they are easily confused with splits overskirts. Find out more about the Robe à l’Allemande or court dress at Marquise’s site! I have also researched the usage of black laces in Rococo and came to the conclusion that they were actually used, though *verifiable* just on mourning clothes. However, the fact that they indeed existed backs me up in actually using them. Right: My digitally color changed version (with my face on it) – not perfect but good enough to give you an idea of what I want I have no doubt that everyone knows what dress that is, so I’ll spare myself the explanations (and for everyone who manages *not* to know this dress, there’s Padawansguide). Anyway… I always liked this dress, but not the color (as in ‘not at all, as it wouldn’t look becoming on me’). 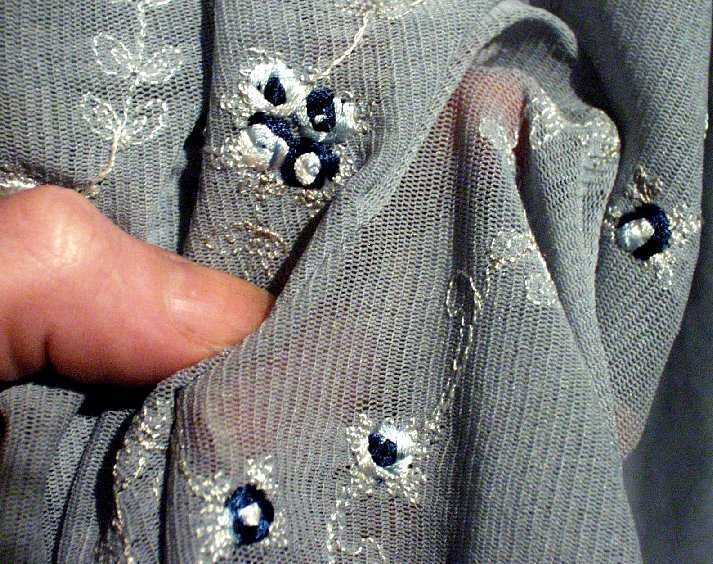 Accidentally I stumbled in a shop over a remnant (two yards) of the embroidered netting that was used for the ‘cape’ on the original gown – but in grey, embroidered with dark blue / grey roses. This gave me the idea of making a color changed version in grey/silver and blue. I’ve bought the netting, by the way; so there’s a fairly good chance that some day I will actually make this color changed version come true. and I think I have enough of a beautiful silver-gray Dupioni silk from a former project left so that I can actually make the corset from it. For the skirt I would like to use a grey chiffon embroidered with vines of silver bugle beads or sequins – which I don’t own and also have not seen yet; so far it only exists in my mind. If I should find it and it’s affordable, I’ll buy it and make this dress for me! 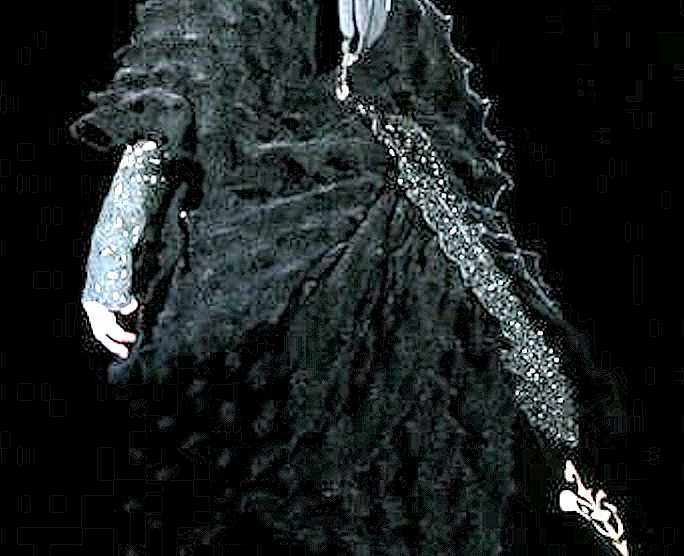 I happened to stumble over this image (well, actually it was a larger group shot from ‘Harry Potter’, from which I cropped this character), and was totally taken by this gown! I have seen just one Harry Potter movie and not read a single book, but I so love this costume! 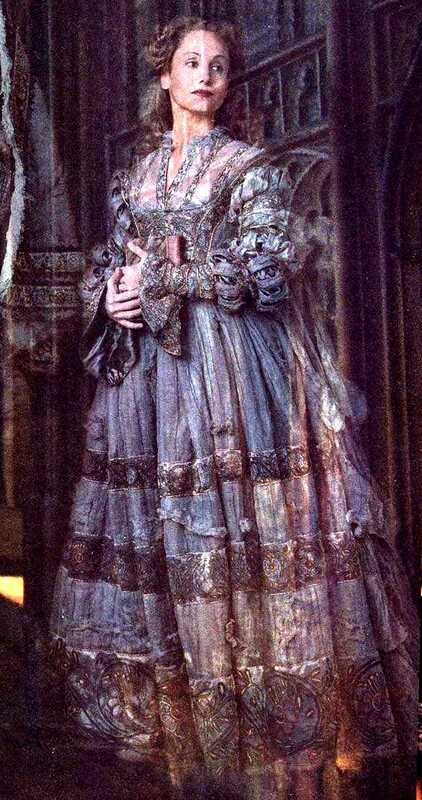 This seems to be a costume designer’s vision of the ‘Cranach’ gown (though the skirt seems to be too full for the exact Cranach gown) in a ‘ghost’ version, and I love the coloring so much (makes me think if I should do a grey version of the Cranach gown…?)! 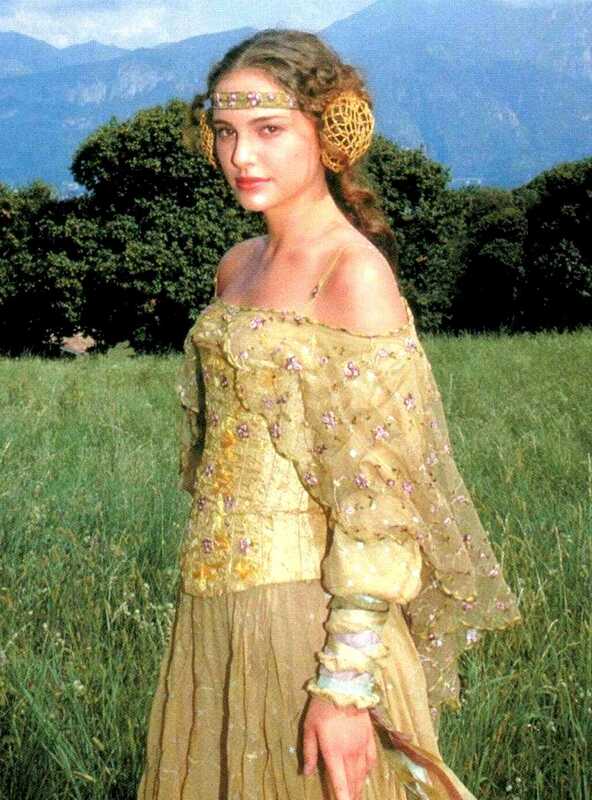 Anyway, even if I currently just have this one picture of the gown and even if I have no idea in which movie this costume was – me wants it! 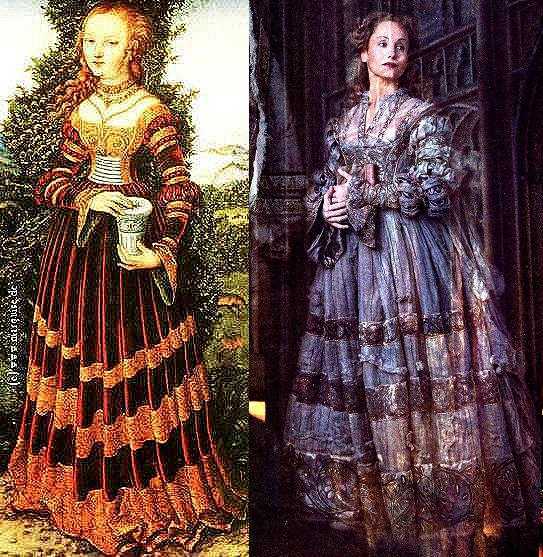 The (edited) bottom picture shows the ‘Cranach’ gown and the Grey Lady directly compared – hey, even the pose is almost the same! 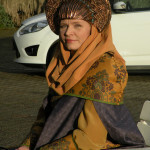 I like this coat – it’s very nice, a bit unusual – and ready for everyday wear. Plus, I still have an old rabbit fur jacket that I can use for it. Picture courtesy of Zelda Gilbert, Costumer’s Guild West. Bottom picture shows the coloring I have in mind. 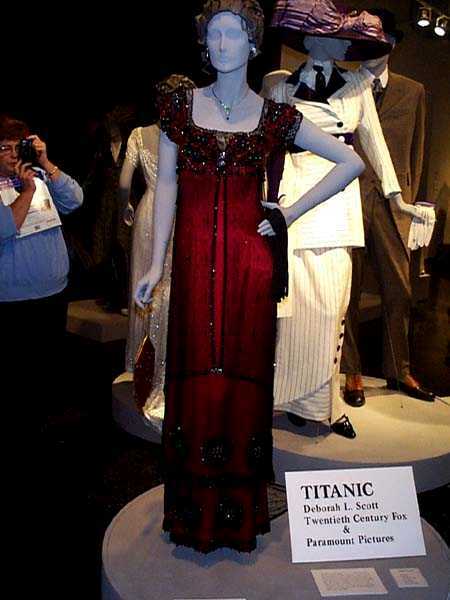 I must admit that I always liked the ‘Jump dress’ from ‘Titanic’ – just not in its original red color. In the past I have made this particular gown several times for customers in different material versions – but always in the same, red color. This beautiful original Victorian bustle gown was sold on Ebay. It’s called ‘The fly’ as the mother of pearl buttons which are sewn to the jacket have actually flies carved to them! I fell in love with it the moment I saw it – and I even liked the color a lot! Well – that was until I saw the recent Fashion show pictures…. 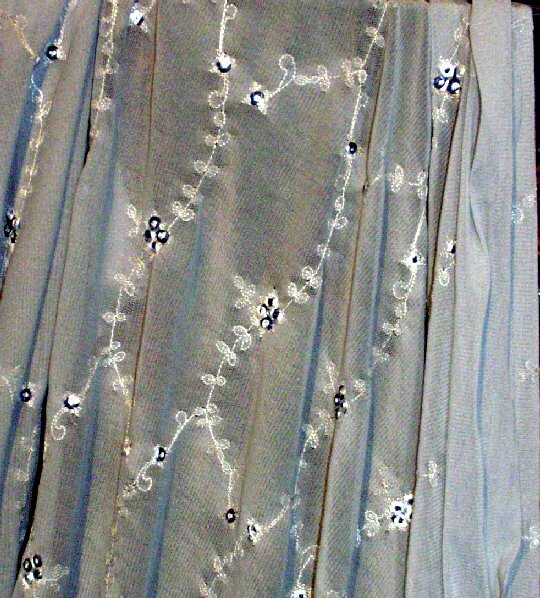 which seems to be glittering with beading (picture edited to bring out details). The lace is $60/meter (a little more than a yard), though, and I would need two meters (at least!) for that ‘forepart’, bodice insert and sleeves – this is why I haven’t bought it yet. Ooh, and isn’t that headdress with those ‘headphone’ things just incredible…? I know now why I remembered the gown ‘glittering’. You may, of course, ask how I could get confused with these gowns, which, even on hasty observation, don’t look the same. 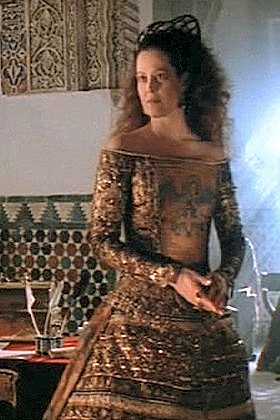 I’m still planning – *if* I should make this gown – to use the beaded lace for it – just because I like it. 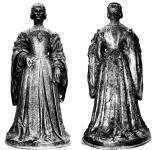 I’ll leave both costumes on this planning page, though, as I have not really started on both gowns yet…There is one thing that these two pictures have in common (apart from two English Queens): The brooch! See my study for that pendant/brooch here. a tad darker – this fabric is, by the way, used for my Elizabeth coronation gown, but I have enough of it to make at least another forepart / sleeves from. 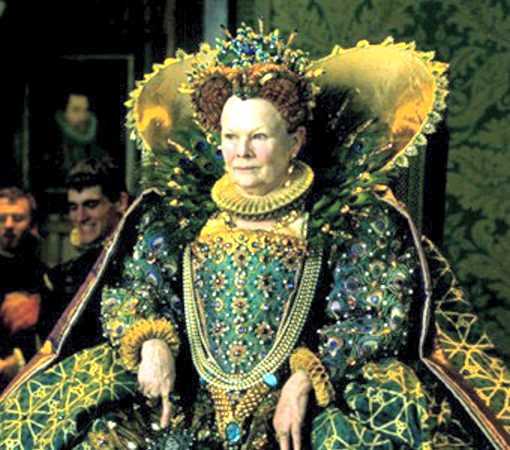 Inspired by the ‘Peacock’ gown Queen Elizabeth (Judi Dench) wears in the movie “Shakespeare in Love”. 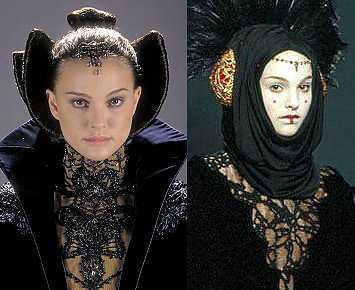 I won’t exactly make it like *that* gown – I personally think it’s, well… a *bit* overdone – but I will let myself be inspired by this true artwork of costuming. It’s so beautiful I could (and do!) cry each time I see it in the movie. I’m thinking of using perhaps some blue-green changeant and golden silk taffeta, in combination with blue/green changeant silk velvet, some golden fabric printing and stones, lots of beautiful sparkling Swarovski rhinestones in sapphire, emerald and topaz. Oh – and peacock feathers of course… many of them; especially on the ‘stomacher’ part of the bodice and on the forepart. Found a nice blue/green taffeta fabric which I could use for this gown. Have not bought that particular fabric yet, though. I would like to make this gown as a doll costume before I start making an actual, human sized gown – this will help me a *lot* in this case to exactly determine how much material I will need for the decorations, which will be the most expensive thing on this gown. 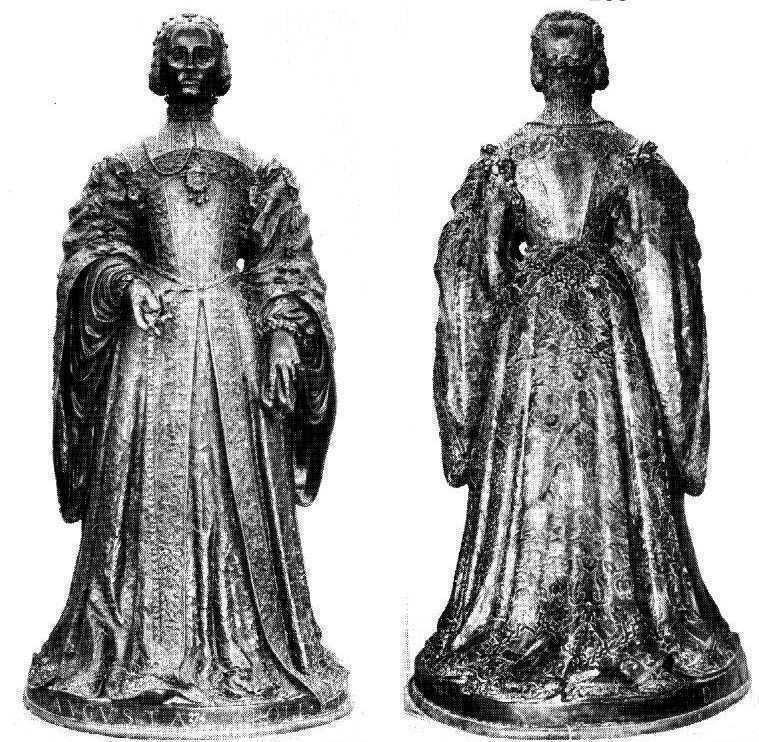 (Picture doesn’t show Eleonora, but Isabella of Portugal, wife of Emperor Charles V, on her grave statue by Pompe, 1564. She’s wearing a dress much similar to Eleonora’s, just that the skirt is split at the front to reveal a forepart – which I like a lot, I think I’ll make mine at least split able, too. 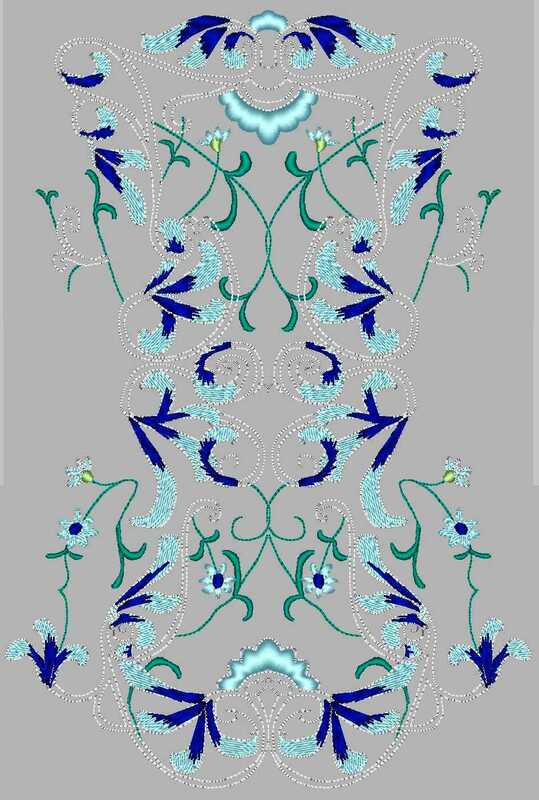 )But I have already programmed the embroidery designs for the guards for my embroidery machine. 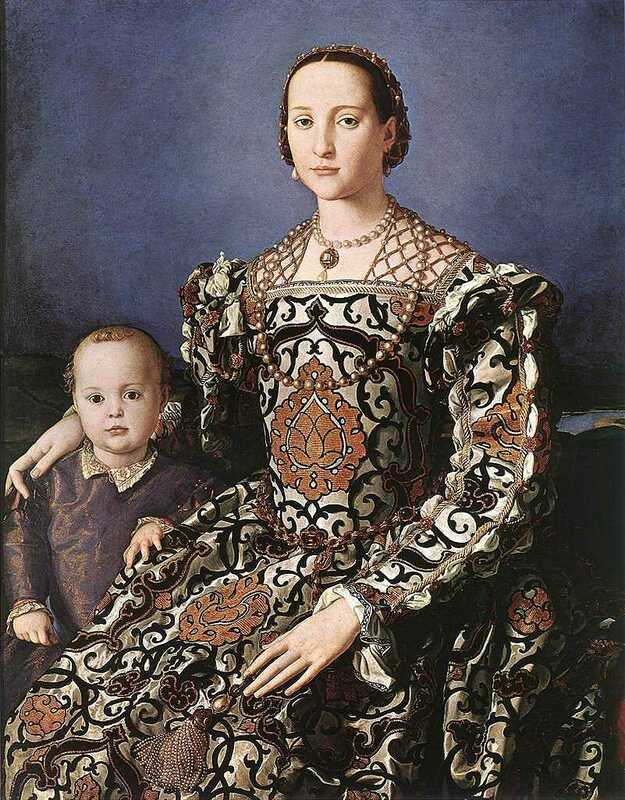 I would use an enlarged version of the original pattern as given in ‘Patterns of Fashion’ for this gown. I know now what fabric I will make the gown from; I already have it. Plus – in addition to the paned sleeves Janet Arnold has drawn to the gown in her book, I will make another pair of sleeves – those here: Those are the sleeves of the ‘Italian gown’ from ‘Elizabeth R’ – find my studying page for that movie here. I just love that chevron look of those sleeves. …made with a similar pattern from one of the various editions of ‘Patterns of Fashion’. This will perhaps become my second red gown. I have found – and I mean found; found *on the street* while a *very* old house of a deceased old lady in my hometown was sorted out – some yards of ex-curtains, made of an incredible, rose colored velvet, woven in two-tone-rose with leaves. I took those giant curtains home and washed them, which brought them back to their former beauty. This will be the material I will be using for this riding gown – at least for skirt and jacket (and, yes, I know that skirt and jacket are not made of the same material in the movie, but I will do it that way). In fact, I’ve more or less already started collecting the materials for this gown… uhm, no, by now I have started sewing trims to the front overskirt…just to see how they would look… plus I have made a test gown for a doll, to determine the final shape. 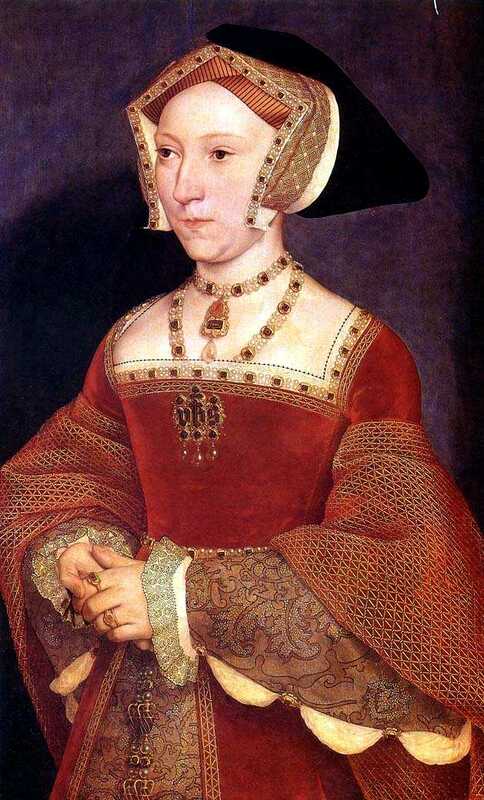 I will have to change the neckline to something more historical, though. 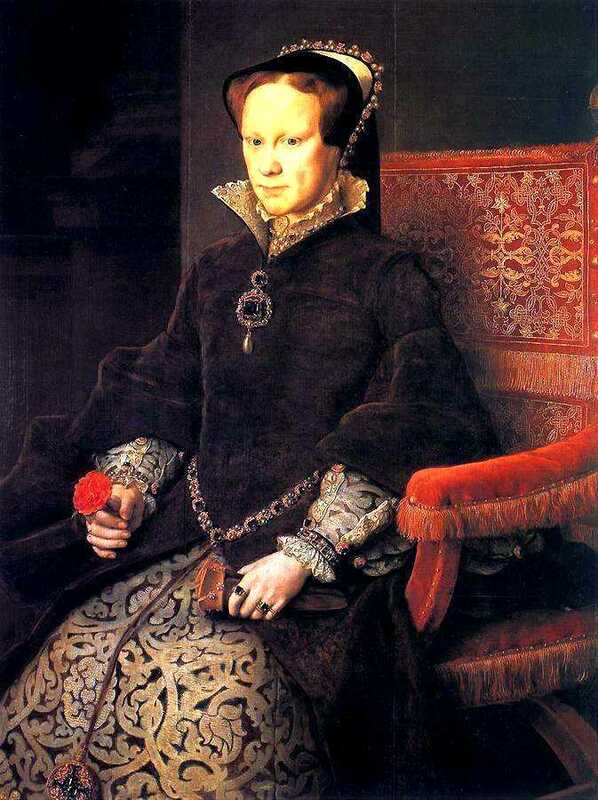 Plus I will be making a doublet with spanish sleeves for it. 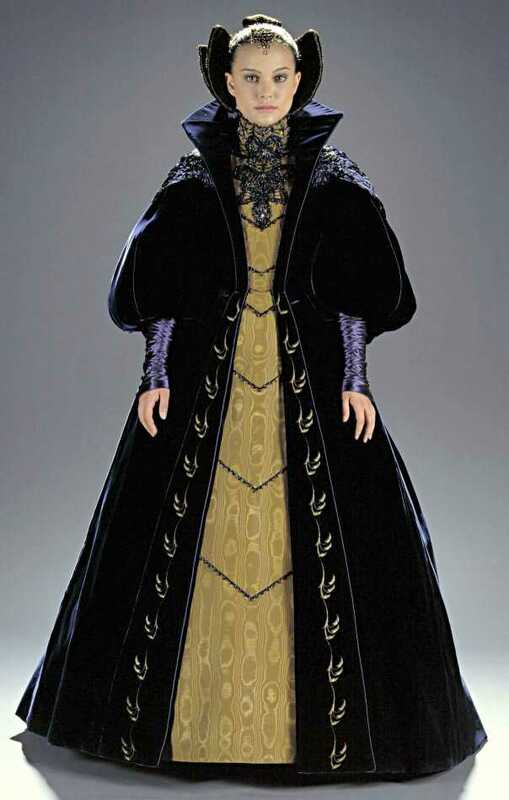 And I probably don’t need to tell you that I would rather say that this gown should be placed in a time about 100 years later than it is in the movie… plus, the neckline is so *not* period at all – especially not for “Isabella the Catholic”, as that particular Queen was called during her reign. 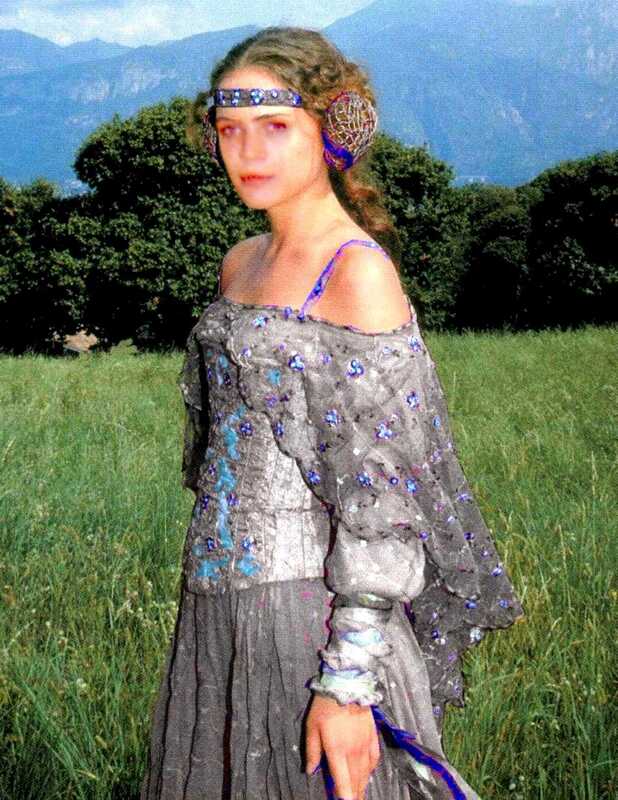 See the studying page for that costume in the “Research” area of this site, under “Movies / 1492 – Conquest of Paradise“. “Gown of ice and crystal” ++ Now – this is a very own design of mine, inspired by three gowns; namely the gown worn by the female moderator of the European Song Contest 2005, the wedding gown from “The Patriot” and the ‘Angel’ gown from “Ever after”. However – I am planning to combine elements from these gowns on a Baroque or Rococo gown. I am quite certain about the loose outer shape of the gown, but the elements of decoration will come while making the gown. Planning is finished, collecting the materials has begun; but I can’t let you know more until it is finished for the purpose it’s planned for. Just one thing I can tell you: This gown will be made with at least 15,000 Swarovski crystals in various colors and sizes plus a large amount of silk that has been mistreated so much that you won’t be able to recognize it as silk any more…. The only thing keeping me from even just starting on this gown is the price for the Swarovski crystals which I currently can’t afford. …plus some gowns from various books, which I can’t show here as these books – especially “Fashion” – are under strict copyright. 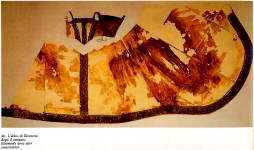 p. 122 – embroidered skirt (with the jacket mentioned above). I’d change the embroidered flowers from red to blue to make them match the jacket. 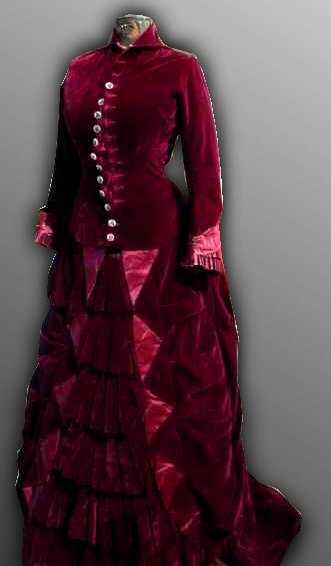 p. 260/261: Cranberry silk velvet / duchesse gown, designed by C. F. Worth. 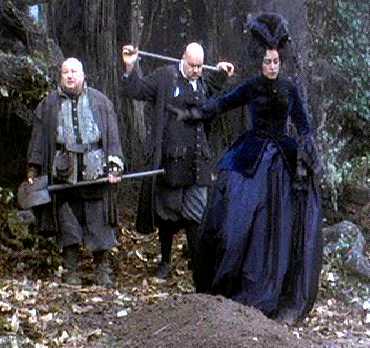 I’ve once said in jest that if I could lay my hands on a piece of the original cut velvet for that gown, then afterwards I’d be willing to have those hands cut off. This gown is so incredibly beautiful that I could cry; but I strongly doubt that I will ever find a matching fabric for this one. Having seen a Fortuny Delphos dress in person (see ‘Museum für Kunst und Gewerbe‘), I must say that they are totally different from what I thought they would be. I had assumed that the gowns were made of something like crushed habotai silk, but they are indeed made of crushed silk taffeta. The pleating is unbelievable small; no more than 3mm / 1/8 inch per pleat, in some cases even smaller. I don’t think that this could be done, especially on silk taffeta, by mere crushing of the fabric; this would result in pleats at least double as wide. But I’m totally in love with how the dresses drape and such! Perhaps if I’m very lucky I will find more of that fabric one day – and you can be sure that I will buy it then! Just beautiful! And I’ve been thinking ever since I saw this jacket how I could come up with a pattern for that darn jacket, *lol*… because as simple as it looks – it’s not. I guess *that* would be a garment for which even *I* would make a muslin!